Mazel tov to Milo & Lucas Lutzky on becoming b'nai mitzvah! We welcome their friends and family celebrating with us this Shabbat. This week's Kiddush Luncheon is sponsored by Lutzky family in Milo & Lucas's honor. Yad Yehuda's Capital Kosher Pantry would be very thankful for all food and other necessary supplies that you can give! Visit yadyehuda.org/kosher-pantry for more information on items that are needed. A donation box is located in the coat room. 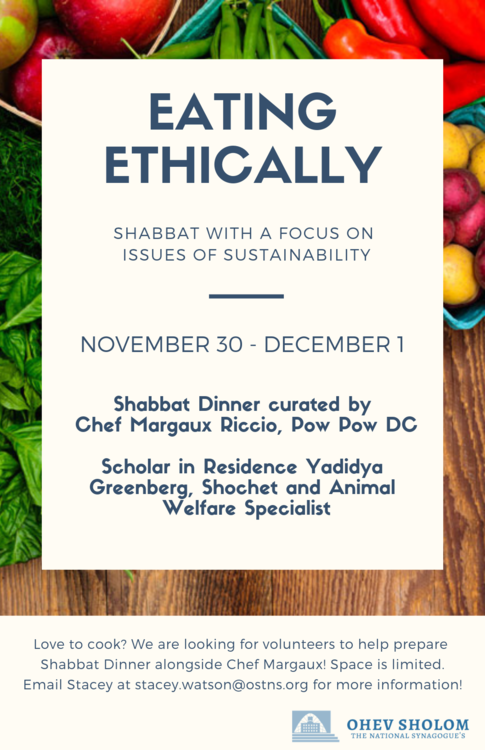 View the menu and register at ostns.org/event/ethicallysourced. In the last Parsha, Vayetzei, we learned of Jacob's flight to Laban's house because of Esau's animosity, and of Jacob’s building of a family. In this Parsha, Vayishlach, we learn of Jacob and Esau meeting once again after many years. Were they reconciled? The Torah says that Esau "kissed" Jacob and the two brothers "cried." However, a midrash tells us that this was not sincere, but rather, that Esau "bit" Jacob. Furthermore, when they "cried," Jacob cried because he was bitten, and Esau cried because of the pain in his teeth because Jacob's neck had turned to marble. The Rabbis comment, "Halacha." "It is a rule" that Esau hates Jacob. This theme is picked up in the Haftorah. The Haftorah for this week is from the Prophet Obadiah (one of the twelve prophets known as the "trei asar," The Twelve). In fact, the haftorah is the entire book of Obadia – only 21 verses. The prophet speaks of God's animosity toward Edom, the nation that descended from Esau. The Haftorah ends with the verse which appears in our daily prayers: "For the liberators will march up on Mount Zion to pronounce judgment on Mount Esau and dominion shall be the Lord's." For a video by Hal Brodsky, Z”L, about this week’s Haftorah, please click here​​​​​.